We had a great showing of out of town boats for the 2011 J/24 Great Lakes Championship, held in conjunction with the annual J/24 U-Gotta Regatta at the Wayzata Yacht Club on October 7-9. Boats came from Duluth, Chicago, and other parts of the Midwest. One skipper came from Florida, another from Chicago and there was even one crew member from Spain! We even have our very own Olympic Medalist racing out there, Billy Allen. This is the place to be. While Scows are known here, there is also a great keelboat scene. The J/24 qualifier had 20 competitors and excellent race management from our inspiring PRO Blake Middleton – a true racers’ PRO. Blake had been on a whirlwind tour of the globe just before the event, and we were lucky to have him back on Lake Minnetonka. Our Race Committee and competitors raced 5 races on Saturday in winds from 7kts to 17kts. Sunday was very light in the morning. The call was made to wait. The wind came in with 10 minutes to spare on the limit. The race was won by Terry Neff and his crew aboard “Bubbles”. Job well done Terry! It was in the 80′s both days. This race was also a true tiebreaker between Bubbles and Zoom. Zoom had some issues with the pin due to an unforeseen additional left shift. It was awful to see them get tangled with the mark in such an important race. Terry was above him. Terry bought the left side big, followed closely by John Heaton on USA 592 Mijah. Motorhome went right, or really just on port because the left was really big for a long time. Bubbles rounded in first, Motorhome in 2nd, Mijah in 3rd. Zoom was really deep, but blasting thru the fleet, always a contender. Motorhome was passed by Mijah at the first leeward gate. Bubbles had launched, at one point I couldn’t see them. Then we saw them on the 2nd downwind leg, 250 yards ahead of us. We started to open a delicious Surly Furious, when a puff nearly knocked us over. The wind had gone very hard to the right, 25 – 30 degrees. Bubbles rounded the right gate in first, Mijah followed in second, and Motorhome went to the left gate. It was a thrilling race. At the final cross Bubbles crossed Motorhome by only 2 boat lengths. Motorhome cheered for them when the gun went off, continued to hike for a 2nd place in the race. Mijah was 3rd. 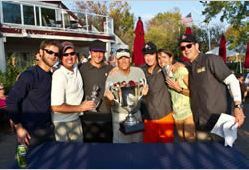 Taylor Neff with crew of Sean Delaney, Paula Neff, Mark Oppen and Paul “Jake” Jacobs aboard Bubbles won the regatta by 2 points.